MoreSteam's Inbox® instructional simulation provides an affordable, participant-driven learning experience focused on application of Lean concepts to transactional processes. InBox is meant for classroom training of participants at all levels within the workplace. SigmaBrew InBox is a virtual workflow Lean office simulation game for classroom training. With InBox, your students can practice the application of a full set of Lean Six Sigma tools in a risk-free, constructive setting that closely mirrors the current state of the "knowledge workplace." Most Lean Six Sigma simulations use role-play activities and a sequence of runs to practice improvement tools for tangible products like paper or assembled items. 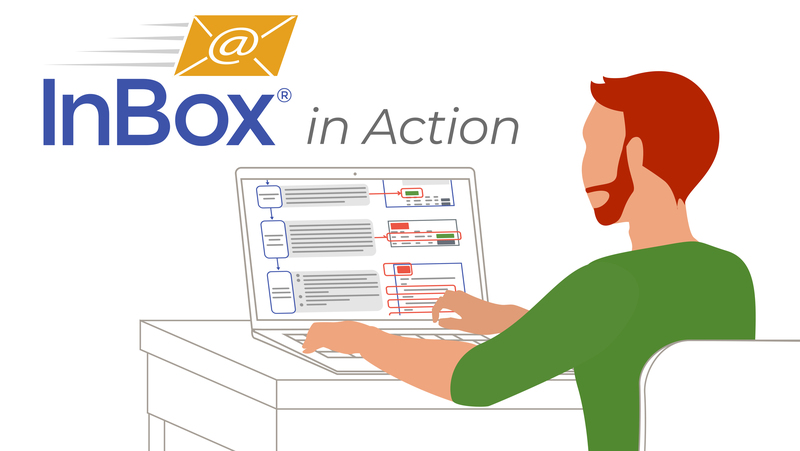 InBox is the first Lean Six Sigma simulation to employ an email-based workflow process that provides first-hand experience with Lean Office concepts where the work flow is essentially invisible. The role-play simulation can accommodate a class size of 15-20 students with active assignments. Because InBox is entirely online, there are no additional simulation parts or pieces to buy and track. InBox effectively illustrates the use of Lean tools within an office environment, including: takt time, work-in-process metrics, error-proofing, line balancing, standardized work, Little's Law, and Theory of Constraints (TOC). How Does SigmaBrew InBox Work in the Classroom? SigmaBrew InBox uses the SigmaBrew case study featuring a large specialty coffee retailer struggling with quality and customer service issues in an increasingly competitive commercial market. The story begins after senior management identifies a good candidate for a Kaizen Event: the unacceptably long cycle time required to open new stores. During the InBox simulation, each participant assumes a role, or job, within the work process. Each role is provided with printed work instructions and an email account. New work projects are initiated by the participant filling the first role using an automated Web-based "Market Demand" scheduling device, and work flows from one process step to another via forwarding of email. Other job roles are supported by additional online "gadgets" that handle work processing by turning inputs from the prior process step into outputs for the current step (such as site selection, rent pricing, accept/reject decisions, and so forth). As the simulation runs, InBox forwards the emails from the first process step to the last, preserving the email string, and therefore documenting all the process activity. Since emails are automatically time-stamped, it is easy to collect data on cycle time by work project, which facilitates statistical analysis and data-driven decisions to improve the process. After the first run, the simulation participants collaborate as an instructor-facilitated group to create a value stream map, identify process waste, and design improvements to the process. Those improvements are incorporated into revised work instructions, and the simulation is then run using the revised rules to determine whether or not the changes have been effective. You can use additional cycles of analysis and improvement to further refine the process depending on how much time you have and how far you want to take the project. We price SigmaBrew InBox by the "instance" of the simulation, which means its use in a single class or workshop. For 1-5 instances, we charge $2500 per instance. For 6-10 instances, the price drops to $2000 per instance, but your organization must commit to six or more to receive the 6-10 pricing for first five instances. We also offer Annual and Perpetual Enterprise licensing. Contact MoreSteam directly for more information on these licenses. Microsoft Office®: English-language (U.S.) version 2007 or higher. Network: Microsoft Excel must be running locally. EngineRoom will not perform correctly if you are running Microsoft Excel over a network as a distributed application. Versions: Only one version of Microsoft Excel can exist. EngineRoom will not perform correctly if there are multiple versions of Microsoft Excel installed on a single computer. Macro Security: EngineRoom contains macros; therefore Microsoft Excel macro security must be set to medium or lower. Toolpaks: The Microsoft Excel Analysis Toolpak and Analysis Toolpak VBA must be installed. Audio: Optional audio in course. Note: The course content requires that any pop-up blocker be disabled. Generally about one day. The first simulation - the broken process - takes a very long time. Successive simulations go much more quickly, and instructors have full control over the concepts they wish to teach and the pace they want to set. Can an individual purchase this product? No. This product is meant for organizations and deployments that have at least 15-20 potential participants. This is a group exercise, and an individual would not benefit from this tool. Is there one single "true" answer? No. SigmaBrew InBox is programmed such that participants can make a wide variety of changes to the process and view the results of those alterations after another simulation run. Click here for a concise review of the top features and benefits. Click here for a more detailed overview of how SigmaBrew InBox works. A guided tour of the program in action.